Under present conditions the motion of planets and satellites is not appreciably perturbed by collisions (viscosity). However, in the asteroidal belt and in meteor streams the interactions are in many cases large enough to perturb the motion of individual bodies. During the hetegonic era, when the matter now stored in planets and satellites was dispersed, we can expect that the interaction between grains was of decisive importance. In ch. 5 we have seen that over a large range of mass the dominating type of motion is a Kepler motion perturbed by collisions. This chapter is devoted to a study of this type of motion, a topic that has previously received little attention. The bodies treated in this discussion are assumed to be large enough that electromagnetic effects may be neglected. In the typical examples treated in sec. 5.4 this condition is that R >>10-4 cm. Radiation effects are also neglected. It is shown that under certain conditions collision-perturbed Kepler motion results in the formation of "jet streams," self-focused streams of particle aggregates held together by means of a "dynamic attraction" or "apparent attraction." It is suggested that meteor streams and the asteroidal jet streams described in sec. 4.3.3 may be of this type. It is further argued that jet streams were of decisive importance as an intermediate stage in the accretion of planets and satellites from grains. It will be seen in ch. 22 that in jet streams characterized by collision-perturbed Kepler motion accretion of large meteoroids may take place. It is likely that the jet-stream milieu is decisive for the formation of meteoroids, and, vice versa, meteoroids may supply us with important data for the understanding of the evolution of jet streams. The small grains of different sizes together with the plasma constitute what is referred to as the interplanetary medium. The presence of this medium means that the motions of small bodies in interplanetary space are  influenced by viscous effects. For planets and satellites these effects are so small that they have not yet been discovered (sec. 4.1). For the smaller bodies we are studying in this chapter, viscosity does play a role, the importance of which increases as the mass of the body decreases. In hetegonic times viscosity effects were much more important than now. It is generally agreed that collisions have been decisive for the evolution of the asteroidal belt. Kiang (1966) finds that a correlation between proper eccentricities and proper inclinations of asteroids suggests the existence (or former existence) of a resistive medium. However, even down to the smallest observed asteroids (R = 105 cm), gravitation is by far the main force, and viscosity only enters as a small correction. The study of the motion of comets has revealed that forces other than gravitation are sometimes important (Marsden, 1968; Hamid et al., 1968). It is often implicitly assumed that in interplanetary space there is a "resistive" medium that is essentially at rest. We know that in interplanetary space there is a radial outward motion of a very thin plasma (solar wind), but its density is too low to affect the motion of grains appreciably (its effect is smaller than the Poynting-Robertson effect). Hence, any such assumed resistive medium must necessarily consist of grains. However, an assembly of grains cannot possibly be at rest because the grains are attracted by the Sun. The only possibility is that they are supported by centrifugal force (i.e., they are moving in Kepler orbits). Hence, a "resistive medium" affecting the motion of the asteroids can be "at rest" only in the sense that on the average there would in principle be an equal number of grains moving in all directions. Observations do not support the existence of such a resistive medium in interplanetary space. It seems likely that, on the average, all small bodies with short periods (i.e., asteroids, comets, and meteoroids) are moving in the prograde sense. Most of the early discussion of the mutual interaction between grains in space has been based on a widespread misconception that we shall discuss in this section. Suppose that a parallel beam of particles is shot through a particulate medium at rest. Then collisions between the beam particles and the particles at rest will scatter the moving particles. The beam will be diffused so that its particles will spread in space. Almost all treatment of the motion of bodies (grains, meteoroids, and asteroids) in interplanetary space is based on this model although it is applicable only under certain conditions, which are usually not found in interplanetary space. There is a basic misconception that grain collisions, either with a  "medium" or with other moving grains, will lead to an increased spread of the grain velocities and orbits. As stated above, this is true for a beam of particles that is not moving in a gravitational field. It is also true for particles in a gravitational field under the conditions that the time between collisions is smaller than the Kepler period and that the collisions are elastic. The most pertinent case for our studies, however, is that of grains making many Kepler revolutions between collisions that are essentially inelastic. In this case collisions lead to an equalization of the orbits of the colliding particles, with the result that the spread in both velocity and coordinate space is reduced. 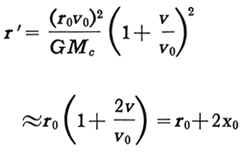 Suppose that two particles with masses m1 and m2 move in orbits with specific angular momenta C1 and C2 (C2 > C1). According to the guiding center picture, they perform oscillations in the radial and axial directions (sec. 3.3) with amplitudes (r1e1, r1i1) and (r2e2, r2i2), respectively, while their guiding centers move along circles of radii r1 and r2. which means C1< C3< C2. Collisions that are essentially inelastic will tend to equalize the specific angular momenta of colliding particles. It is easily seen that collisions also will tend to make the particles oscillate with the same amplitude and phase. From the above discussion, one concludes that the general result of viscosity is to make the orbits of particles more similar. This effect is closely connected with what is termed apparent attraction in sec. 6.4.1. In spite of the fact that celestial mechanics is several centuries old, few, if any, textbooks give a clear picture of some simple cases that are of interest for the present discussion. This is because celestial mechanics is usually  presented with a somewhat formidable mathematical apparatus that conceals some important physical aspects of the phenomena. The conceptual approach used here was chosen to clarify and emphasize certain fundamental characteristics of the phenomena under discussion. Suppose that a number of particles ("apples"; see Alfvén, 1971) are enclosed in a spacecraft that is orbiting around a central point mass Mc in a circle of radius r0 (measured from the center of gravity of the spacecraft). If the masses of the spacecraft and of the particles are so small that gravitational attraction between them is negligible, all the particles will move in Kepler orbits around the central body. At the same time, they are subject to the constraint that they must permanently remain inside the spacecraft. The confinement of particles in a physical enclosure provides an idealized model of those phenomena which cause the particles in a jet stream to keep together. We shall study what Kepler orbits are selected by this constraint and how these orbits look, as seen from the spacecraft. We introduce an orthogonal coordinate system with the origin at the center of gravity of the spacecraft, with the x axis pointing away from the central body and the y axis pointing in the direction of motion (see fig. 3.3.1). The condition that a particle in a Kepler orbit must remain inside the spacecraft necessitates that its Kepler period TK be the same as that of the spacecraft (i.e., its semimajor axis is r0 ). The most simple case, the particle being at rest in relation to the spacecraft, occurs when both the eccentricity and inclination are zero. In this situation the particles are located at the distance r0 from the central body (i.e., approximately on the y axis). Hence, the particles in the spacecraft are aligned in the direction of orbital motion along the line (or strictly the circular arc) through the center of gravity of the spacecraft. However, it is coupled with an oscillation in the y direction with twice the amplitude. If a large number of particles collide inelastically or if gas in the spacecraft damps their oscillations, the eventual result will be that all the particles are at rest, lined up along the y axis. Both the oscillation in the z direction and the oscillation in the x-y plane can easily be described by the guiding-center method described in ch. 3. Using that terminology we can state: If particles in Kepler motion are confined inside a spacecraft, their guiding centers will line up along the y axis. where S is the vector with magnitude (x2 + z2)1/2 from the origin to the particle projected on a plane perpendicular to the motion. In the x-y plane, the particles move in epicycles as depicted in fig. 3.3.1.
in relation to an unperturbed particle. Hence we see that the state of motion produced by the perturbation is such that the y values of all the guiding centers change in proportion to the original y value of the perturbed particle (fig. 6.4.1). We obtain A = 1 after a time t = tA=1, which can be calculated from eq. (6.4.13). At this moment, all the guiding centers are on the same vector radius as the center of gravity of the spacecraft. The actual positions of the particles are scattered; however, all remain inside a square with its sides equal to 4x0 and its center at the center of gravity of the spacecraft. For a spacecraft in orbit (rO=109 cm) around the Earth (Mc =6 X 1027 g), particles with a mass of 6 g must be much more than 1 cm apart for the apparent attraction to be more important than the gravitational attraction between the particles. We have treated a very simple model to clarify some aspects of celestial mechanics which are of special interest for studying accretional processes. The role of the spacecraft walls in our model is to compel all the particles to orbit with the same period. We have seen (sec. 6.4.1) that if the gravitational field is unperturbed (i.e., an inverse square force) the particles will align in the direction of motion along the line through the center of gravity of the spacecraft. If the orbits of the particles have nonzero eccentricities and/or inclinations, then their guiding centers will align along the path of the center of gravity of the spacecraft. This focusing, referred to as the transverse apparent attraction, is a consequence of the gravitational field of the central body around which the spacecraft orbits. If the gravitational field is perturbed (sec. 6.4.2), we have found for certain types of perturbation that the particles move toward the center of gravity of the spacecraft. We have referred to this attraction as the longitudinal apparent attraction. It is important to consider to what extent similar phenomena may occur in astrophysics. Our model is based on the constraint that the particles all orbit with the same period. This effect can in reality he achieved by other means (for example, by gas friction, mutual collisions, and electromagnetic effects). The lining up of particles (due to transverse apparent attraction) is basically the same phenomenon as the focusing effects that produce jet streams in interplanetary space. The perturbation-produced attraction of the aligned particles to a common point (longitudinal apparent attraction) is related to the formation of bodies within jet streams, a process that is applicable to the formation of comets within meteor streams (ch. 14) In view of what has been said in sec. 6.1, we may look on our spacecraft as a jet-stream workshop in which meteoroids are being produced (ch. 22). Let us consider how mutual inelastic collisions can assume the role of the spacecraft walls in the model just discussed (i.e., to compel the particles to orbit with similar periods). Baxter and Thompson (1971) have treated the interaction between particles in Kepler orbits, considering the effect of inelastic collisions on the evolution of an initially smooth distribution of particle orbits. For a two-dimensional system (all motion in a single plane), they found that inelastic collisions produced a negative diffusion coefficient. Hence, an initially smooth distribution will evolve and show radial density clustering (see fig. 6.6.1). In a later paper, Baxter and Thompson (1973) generalized their results to a three-dimensional case. They further concluded that, although in order to simplify the calculations they have assumed axisymmetry, this is not essential for the clustering. A similar process is expected to occur also in an eccentric jet stream. These investigations are essentially an application of plasma-physics formalism to the Kepler motion of grains, the grains assuming the role of interacting atoms, ions, and electrons in a plasma. This opens an interesting field of research that hopefully will lead to a better understanding of jet streams. For example, fragmentation and accretion at collision (which are not included in the simplified treatment by Baxter and Thompson) and the energy balance in a jet stream are important factors to be studied. Further, it is not yet clear what degree of inelasticity is required for jet-stream formation Numerical simulations by Trulsen (1972b) have shown that, with elasticity exceeding a certain limit, jet-stream formation does not take place. Meteorites can yield much information on the processes occurring in their parent jet streams. Observations in meteorites demonstrate (secs. 22.6  through 22.8) that most collisions involving their component grains were highly inelastic, leading to shock deformation, melting, and vaporization; solidified melt spray, broken rubble, and shocked metal are the most common components observed in ordinary chondrites and achondrites. It should further be pointed out that collisions between the solid particles are not really necessary for jet-stream formation. As is evident from the model of sec. 6.3, this can be achieved by a mechanism that makes the particles exchange momentum so that their orbital parameters become similar. As an example, suppose that all particles reemit gas molecules that have previously been temporarily incorporated by occlusion, implantation, or surface adsorption. The emitted molecules hit the other particles, thereby transferring momentum. The "viscosity" caused by the gas exchange may significantly contribute to jet-stream formation. A theoretical investigation of this case is highly desirable; some discussion is given in sec. 6.8. The preservation of delicate features of condensed grains in carbonaceous meteorites provides suggestive observational evidence for equalization of orbital grain energy by means other than collision in these particular jet streams (sec. 22.6). We shall treat here a simple case that illustrates how the diffusion coefficient becomes negative. Consider a grain the guiding center of which orbits in a circle with radius r0 around a central body. The grain itself makes radial oscillations with amplitude x0 around the guiding center. Suppose that we have a population of such grains and divide it into two groups, one outside and one inside a certain value r'. For the first group, we define x1 = r1 - r', and, for the second, x2 = r'-r2 (see fig. 6.7.1). We suppose that x0, x1, and x2 are much smaller than r'. collisions take place only inside the domain within the big triangle in fig. 6.7.1. Consider two equal surface elements, one in the triangle a and the other in b, situated symmetrically with respect to the border line x1 = x2. For these two elements, x1 + x2 and, hence, have the same value, but if > 0, the value of v is larger for the element in a than for the element in b (because x1 > x2). The integrals in eq. (6.7.4) can now be evaluated by summing all such symmetric pairs of elements into which triangles a and b can be divided. Consequently, if > 0, D > 0. If < 0, we find D < 0, so that there is a net transport of guiding centers inward through r'. Hence, we have shown that in either case an excess of guiding centers is transmitted from the low-density region into the high-density region as a result of a collision. This means that the diffusion coefficient is negative. Suppose that a body moves with velocity v0 and semimajor axis r0 in a Kepler orbit that is sufficiently close to a circle to allow us to treat it according to the guiding-center method. Suppose further that the field is that due to an unperturbed inverse square force. Hence, the orbit of the body will remain an ellipse that does not precess. FIGURE 6.7.1. Simple model of negative diffusion. The region of collision is shown (above) for two particles, one with guiding center at x1 = r - r' and another with guiding center at x2 = r' - r. Both particles are oscillating radially with amplitude x0. In the x1 x2 diagram (below) collisions can take place if x1 + x2 is located inside the triangle. If a perfectly inelastic collision takes place in the domain a the guiding center x2 is transmitted outward through r'. If the collision takes place in domain b, a similar inward transmission of the guiding center at x1 takes place. If the density increases with r, the collision frequency is larger in domain a than in domain b, with the result that the diffusion goes outward; i.e., toward the higher density region. Hence the diffusion coefficient is negative. if v << v0. Hence, it will oscillate with the amplitude 2x0, and its maximum distance from the orbit of the body will be 4x0. The particles emitted with a velocity v will remain inside a torus with the small radius x = x0 where x0 is given by eq. (6.8.1) and is between 1 and 4, depending on the angle of emission. This result also applies to the case when the body does not move exactly in a circle. We will use x as a measure of the small radius of a jet stream even if some of the particles oscillate with a greater amplitude. As a typical example, the thermal velocity of hydrogen molecules at T = 300K is of the order 105 cm/sec. If we put v0 = 3.106 cm/sec (= the Earth's orbital velocity), we have, with = 1, x/ r0 = 1/30. Jet streams differ from the rings in Laplacian theories in the respect that me mean free path of particles in a jet stream is long compared to the dimensions of the jet stream. Further, jet streams need not necessarily be circular. In fact, the phenomena we are discussing will take place even in jet streams with high eccentricity. If we consider u = 1O5 cm/sec as a typical relative velocity and 3 g/cm3 as a typical grain density, we find for the respective values of grain radius R the values of given in table 6.8.1. To keep the jet stream together, the interval between collisions for a given particle tv must be smaller than the time constant for the dispersive processes. Most important of these are the differential precession of the different orbits in the jet stream and the Poynting-Robertson effect. For an order of magnitude approximation we may put tv =105 yr = 3 x 1012 sec (see Whipple, 1968). This value for tv gives the values of , and, from eq. (6.8.4), the values of N found in table 6.8.1. The contraction of a jet stream is produced by inelastic collisions between the particles. The time constant for contraction should be a few times tv. This also means that a jet stream can be formed only when there is no disruptive effect with a time constant less than tv. For example, the differential precession of the pericenter and the nodes of an elliptic orbit will disrupt a jet stream unless tv is smaller than the period of the differential precession. A more refined model of jet streams should take into account the size distribution of the particles. Since the smallest particles are usually the most numerous, their mutual collisions will be the most efficient in keeping a jet stream together. As the relative velocities in the interior of a jet stream decrease, the accretion of grains to form larger bodies will become more and more efficient. Hence to within an order of magnitude, tv is the contraction time of the  jet stream. However, if larger bodies are formed, the result is that tv will increase and the contractive force will be smaller. Eventually, the jet stream may no longer keep together. It should be remembered that a jet stream is formed only if there is enough interaction between the particles. In the Saturnian rings, this interaction between the particles is very small. They do not form a jet stream but orbit with periods proportional to r3/2. Let us examine what happens if a grain collides with a jet stream. Suppose that the grain moves in an orbit which at one point a crosses the jet stream (see fig. 6.9.1). (In principle, its orbit could cross the jet stream at four points, but we confine ourselves to the simplest case.) We are considering motions in an unperturbed Newtonian field, which means that me orbits remain unchanged unless the particles collide. In the region where the grain crosses the jet stream, it will sooner or later collide with one of the particles of the stream. The collision is likely to be partially inelastic; in other words, part of the kinetic energy due to the relative motion is dissipated. The collision may result in breakup of one of the colliding grains, or of both, into a number of fragments. After the collision, each of these fragments will move in a new orbit that in general differs from the initial orbit of the grains. This orbit may be situated either entirely within the jet stream or partially outside it. However, all possible orbits of the fragments will necessarily bring them back again to the point at which the collision took place. Since by definition this point was situated inside the jet stream, all the fragments will repeatedly cross the jet stream. (An exception to this rule occurs when the collision has taken place near the surface of the jet stream and the latter has had time to contract so much before the next collision that the point of the first collision then lies outside the stream.) Sooner or later this orbital intersection will lead to new collisions with the particles in the jet stream. As on the average the collisions reduce the relative velocities, the fragments will finally be captured by the jet stream. At the same time, this capture will change the shape of the jet stream so that the new orbit is a compromise between its original orbit and the orbit of the colliding grain. Hence, a grain that collides with a jet stream will be "eaten up" by it, with or without fragmentation. In the former case, the jet stream "chews" before it "swallows." This again can be considered as a consequence of the focusing effect of a Newtonian field. FIGURE 6.9.1.-The capture of a grain by a jet stream. The shaded area represents the jet stream. The orbit of a gram (thick curve) intersects the jet stream at a. Collisions lead to fragmentation and fragments are ejected mainly in orbits like 2, but some fragments may move in orbits like 1 or 3. All these orbits carry them back to the point a. Subsequent collision at a may lead to further fragmentation, but, if the collisions are at least partly inelastic, the final result is that all the fragments will be captured by the jet stream. ....are colliding with the jet stream, a temporary state of equilibrium is attained when the energy loss due to internal collisions is balanced by the energy brought in by the "eaten" particles. However, the new particles increase the value of N, and, hence, the energy loss. The final destiny in any case is a contraction of the jet stream (Ip and Mendis, 1974). The internal structure of a jet stream depends on the size distribution and on the velocity distribution of its particles. We have only discussed the ideal case, in which all particles are identical. In a real jet stream, there is likely to be an assortment of bodies of all sizes subject to the competing processes of accretion and fragmentation. As the internal energy of the jet stream decreases, the relative velocities will also decrease. This means that collisions will not lead as often to fragmentation; accretion will dominate, and larger bodies will be formed inside the jet stream. If the Newtonian field is perturbed, the jet stream will precess, the nodes moving in the retrograde sense and the pericenter moving in the prograde sense. However, the rate of precession depends on the orbital elements of me individual grains, and these are slightly different for each particle inside me jet stream. Hence, the perturbations tend to disrupt the jet stream. The permanence of the jet stream depends upon whether the viscosity, which keeps the jet stream together, is strong enough to dominate. In general, large bodies will leave the jet stream more readily than small bodies. (1) If a large number of grains are moving in a Newtonian field, its focusing effect (apparent attraction) may lead to the formation of jet streams. These jet streams are kept together by mutual collisions (i.e., viscosity) under the condition that the collisions are sufficiently inelastic (negative diffusion). (2) The jet streams have a tendency to capture all grains that collide with them. (3) The relative velocities of the particles in a jet stream decrease and the jet streams have a tendency to contract. (4) Inside a jet stream the grains will aggregate to larger bodies. (5) Large bodies formed in a jet stream may break loose from it. The term "celestial object" includes planets, satellites, comets, stars, nebulae, galaxies, quasars, and pulsars. It would seem that jet streams should also be counted as "celestial objects." Certainly they are transient, but so are comets and nebulae. (1) Meteor streams. Meteor streams will be treated in detail in chs. 14 and 19. Cometary nuclei and parent bodies of meteorites are probably products of particle focusing, clustering, accretion, and compaction in such particle streams. Hence, the meteorites may give us a record of jet-stream processes (ch. 22). They provide a wealth of information on the collision processes in particle streams, including the alternating fragmentation and accretion in the course of equalization of energy of grains and embryos. A detailed discussion of the jet-stream record in meteorites is given in sec. 22. (2) Asteroidal jet streams. A discussion of asteroidal jet streams has been presented in sec. 4.3.2. (3) Hetegonic jet streams. Hetegonic jet streams may be important as an intermediate stage in planet/satellite formation. This will be discussed in ch. 12. (4) Finally, there may be galactic jet streams. In fact, a jet stream may be formed whenever interacting bodies move in periodic orbits. This may take place, for example, in galactic nebulae, possibly leading to a "stellesimal" formation of stars (ch. 25).